Pruned: Let there be light! “The sun has stopped shining in Rattenberg,” the AP reported recently; winter darkness has gripped the picturesque Austrian town. 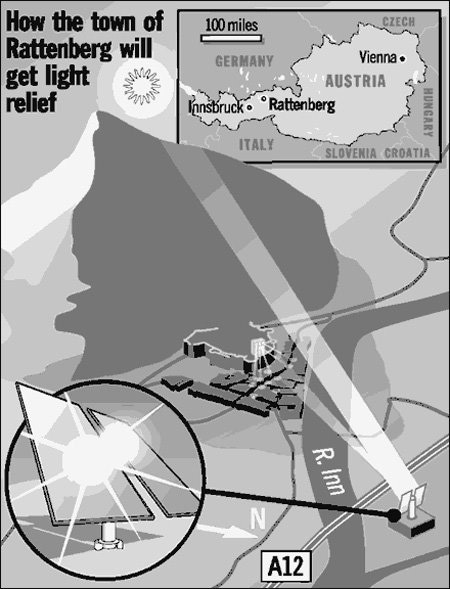 But a solution, cinematic über-villainy in sensibility and scope, has been engineered by Bartenbach Lichtlabor GmbH involving 30 heliostats, “essentially rotating mirrors, mounted on a hillside to grab sunshine off reflectors from the neighboring village of Kramsach.” And those 4 months of gloom and seasonal clinical depression may soon be alleviated. More from Lichtlabor in a nearly year-old Telegraph article: “Sunlight brings security and a better standard of living. We decided that the light should come from above, not from artificial lights at house-level, and we decided to create an impression that the sun really is there. “In the neighbouring village of Kramsach there is plenty of sun and so we can catch the light from the mountain there and send it to Rattenberg." To repeat: to avoid confusion with the real thing. I was about to post about this thing! Agh! Post it anyway. You had no post yesterday. And that's just outright criminal! 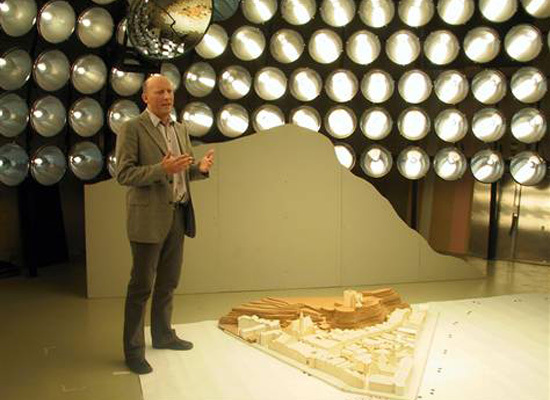 Actually, perhaps you've already done so: BLDGBLOG: Mirror displacements? It would have been in reference to that, yes sirree. But no more. Well, maybe I'll post about it anyway, I love this story. Can you grow plants by mirror-light? I think a more interesting question would be -- what would you do if they can?